Neil Sedaka’s amazing career has touched parts of seven decades. From his beginnings as a pop singer in the 1950s and 1960s to his rebirth as a songwriter in the 1970s, Sedaka has had a remarkable run. Not only has Sedaka had hits with the over 500 songs he has written or co-written, many of music’s biggest names, from Elvis Presley to Frank Sinatra to The Carpenters have had success with his music. Sedaka’s popularity has always been high with his fans in Great Britain and, in April 2006, they got to see Sedaka in a stripped-down performance – just the man and his piano – at the legendary Royal Albert Hall. 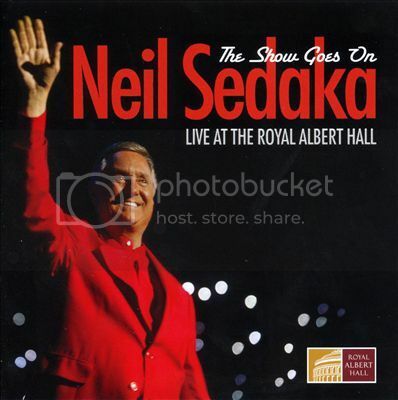 This show was recorded and makes up the CD Neil Sedaka: The Show Goes On – Live At The Royal Albert Hall. The show opens with the pretty ballad “The Other Side Of Me,” from Sedaka’s 1973 album, The Tra-La Days Are Over. Sedaka is in strong voice in this track that sounds as if it could have been a movie theme. The track was also recorded by Donny Osmond and, later, Andy Williams during the 1970s. The Queen Of 1964, from Sedaka’s 1975 album, Overnight Success, finds the singer showing his humorous side. The song is a tale of an aging groupie who nine years after her 1964 prime was not very much in demand. Sedaka reaches back for the classic “Oh Carol,” once again showing his sense of humor during the spoken word part, saying “not one of my best lyrics.” The crowd assists with the vocals and provides rhythmic hand claps for “Happy Birthday Sweet Sixteen,” a top-ten song for Sedaka in 1961. On the ballad “Where The Boys Are,” Sedaka performs a song made famous by Connie Francis. Similarly, Sedaka offers a strong rendition of the poignant ballad “Solitaire,” made famous by The Carpenters, Elvis Presley and, more recently, Clay Aiken. Few performers have had the longevity of Sedaka. From 50s pop singer to hit maker for others, Sedaka’s career has been remarkable. Neil Sedaka: The Show Goes On – Live At The Royal Albert Hall offers a glimpse of the man in an intimate, stripped down setting that shows the strength of these songs.